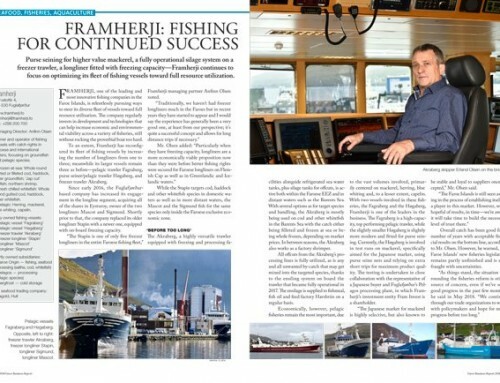 Leading saithe specialist Faroe Origin is a fishing company, primary processor and seafood exporter with a widening supply of species and products—with redfish on the rise lately, new products and species are added slowly but surely. 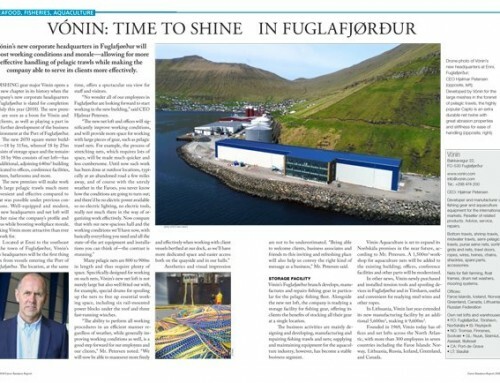 With its six pair trawlers fishing all year round to keep its two processing facilities busy, Runavík-based seafood exporter Faroe Origin has long been a force to be reckoned with in the saithe business, and increasingly beyond. 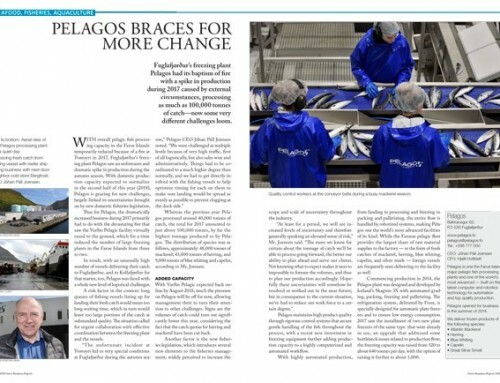 Originally focusing squarely on frozen fillets, loins and other portions, the company has steadily expanded its product range both in terms species and process, today offering fresh, frozen and salted seafood. 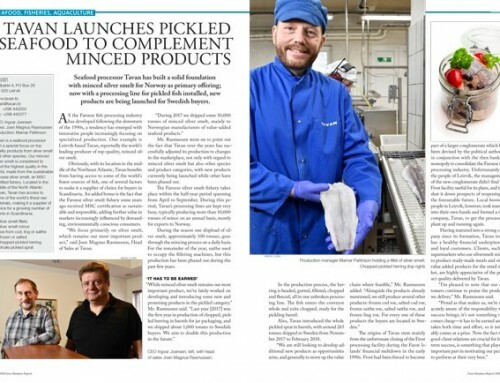 Two major developments within the last few years include the launch of fresh fillets and loins of saithe for markets in Europe from the company’s processing plant at Runavík, and the launch of salted fillets and splits of cod and other whitefish from its facility at nearby Toftir. More recently, fresh whole redfish has seen a revival. After a dull period of a couple of decades, the high-value species has reemerged in domestic fisheries offshore west of the Faroe Islands, amounting to just under 2,800 tonnes in 2017 and a similar tonnage expected this year (2018). Meanwhile, according to CEO Jens Pauli Petersen, the traditionally strong Faroese market position on saithe in Germany and France, has been boosted in relevant segments over the past three years or so, since Faroe Origin initiated weekly shipments of fresh fillets and portions. As for Origin’s frozen produce, most of it is saithe processed as fillets or loin/center/tail portions, individual quick frozen (IQF) or interleaved. The markets are mostly France and Germany but also increasingly Poland. While frozen products generally fetch a lower price than fresh, key advantages with the frozen category include lower sensitivity to the time factor. 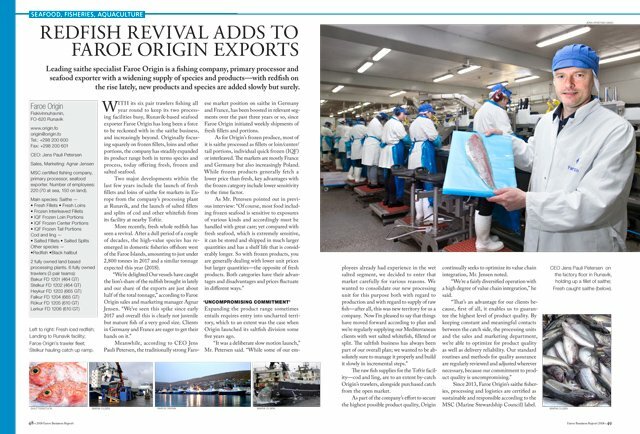 Expanding the product range sometimes entails requires entry into uncharted territory, which to an extent was the case when Origin launched its saltfish division some five years ago. The raw fish supplies for the Toftir facility—cod and ling, are to an extent by-catch Origin’s trawlers, alongside purchased catch from the open market. As part of the company’s effort to secure the highest possible product quality, Origin continually seeks to optimize its value chain integration, Mr. Jensen noted. 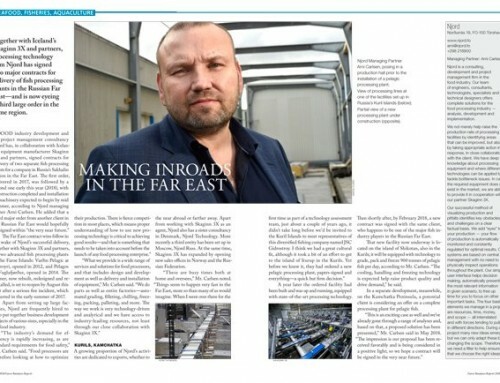 “We’re a fairly diversified operation with a high degree of value chain integration,” he said. Since 2013, Faroe Origin’s saithe fisheries, processing and logistics are certified as sustainable and responsible according to the MSC (Marine Stewardship Council) label.